The definitive collection of imported delicacies is presented in our tailored isothermic cooler. It's the perfect gift to leave a lasting impression on a birthday, anniversary, or for clients and colleagues. French Artisan Cheeses, Monte Chevre Truffle Goat Cheese. Stuffed Olives, Fig and Orange Spread, Barrel Aged Balsamic. Blood Orange Olive Oil, White Truffle Oil, Lindt Dark Chocolate. Measures 9" x 10" x 11". 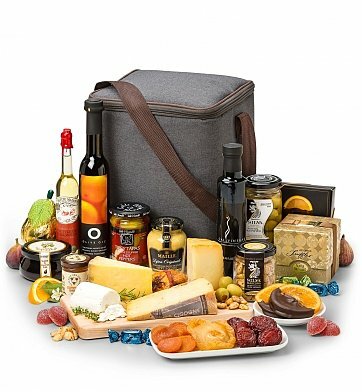 Ultimate Imported Cheese Banquet is a hand delivered gift. These gifts are delivered by one of our local design centers located throughout the United States and Canada. Same day delivery is available for most gifts when ordered before the cutoff time. The cutoff time for Ultimate Imported Cheese Banquet is in the recipient's time zone. Loved everything! Very fresh and beautiful presentation. Makes for a wonderful gift.